In June 1964 Julius Chambers began practicing law in Charlotte, N.C., and eventually founded a law firm that would become the first integrated one in North Carolina history. Chambers, his partners, and lawyers from the NAACP Legal Defense Fund successfully litigated a number of key cases before the United States Supreme Court that would help to shape American civil rights laws. These include Swann v. Charlotte-Mecklenburg Board of Education (1971), which upheld busing as a means to desegregate schools, and two significant Title VII employment discrimination cases. It is said that Chambers’ firm did more to influence civil rights law than any other private law firm in the United States. 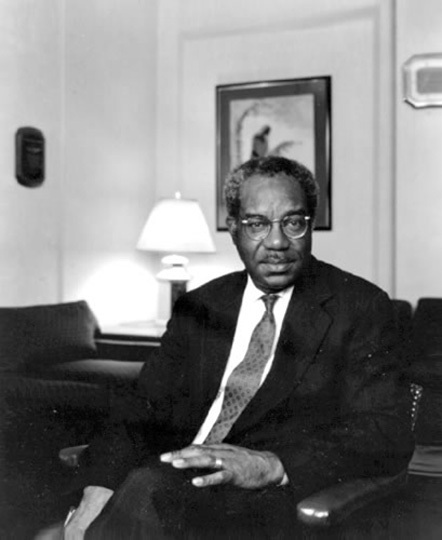 Chambers graduated first in his class from the University of North Carolina School of Law and was the first African-American editor-in-chief of the school’s law review, as well as the first admitted to the Order of the Golden Fleece, the university’s highest honor society. He also earned a masters degree in history from the University of Michigan and a master of laws degree from Columbia University School of Law. In 1984 Chambers joined the NAACP Legal Defense Fund in New York City as its highest executive, a position previously held by Thurgood Marshall and Jack Greenberg. During this period, the Fund was perhaps best known for its work in defense of the affirmative action programs of the 1970s and 1980s. Chambers served on the Board of Governors of the consolidated University of North Carolina during the 1970s. In this position he supported the integration of the university system. In 1993 he left the NAACP to return to his undergraduate alma mater, North Carolina Central University, as chancellor. During his eight years in this position, the school grew in size and standing. His most notable contribution to the campus was the addition of the Biomedical Biotechnology Research Institute, a research center that focuses on diseases that disproportionately affect African Americans and other minority populations. Chambers was the first director of the UNC Center for Civil Rights and was adjunct professor of law at several law schools. He continues to practice law today with his Charlotte firm.